The Court shall respond promptly to all administrative records requests. This shall be done in accordance with both the letter and the spirit of the General Rule 31.1 (GR 31.1 Access to Administrative Records) and case law related to the disclosure of administrative judicial records. The Superior Court Administrator is designated as the public records officer. The Administrative Assistant to the Court Administrator is designated as the backup public records officer. Eachemployee contacted shall either (1) indicate that he or she has no responsive documents; (2) indicate that he or she has responsive documents and provide them; (3) specify a reasonable time within which he or she can search for the records and provide a more thorough response; or (4) describe how the request should be clarified. If theemployee has responsive documents, he or she should provide them to the Public Records Officer, and, if documents are exempt (or may be exempt) from public disclosure, provide a summary of why the documents are or may be exempt, with specific reference to the provision of GR 31.1, state or federal law that is the basis for the exemption. In the event it is difficult to produce copies of the responsive documents, either because of their size or format or because they are numerous, the employee should contact the Public Records Officer to determine whether there are options to producing copies. The Public Records Officer shall ensure that records of former staff members also are searched for requested information. The staff shall assemble the individual responses and provide a consolidated response to Public Records Officer. If applicable, the Public Records Officer shall also ensure that records of former staff members were searched for the requested information. 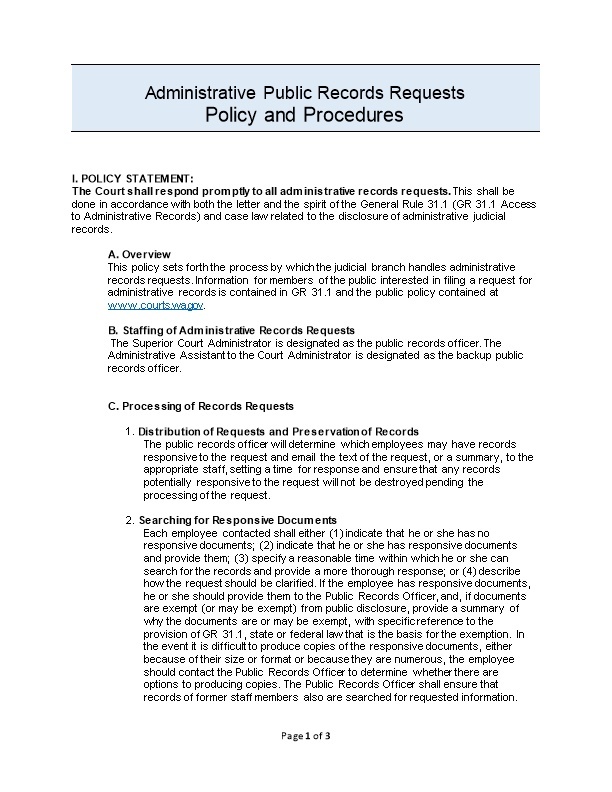 The Public Records Officer shall respond to the requestor within five business days after receiving the request by: (1) providing responsive documents along with a statement of why any documents are exempt from disclosure; (2) providing a date by which responsive documents will be provided; or (3) requesting clarification of the request. The Public Records Officer will make every effort to work with the requestor to clarify the request and to provide responsive documents.Upon request, the Public Records Officer will provide a copy of any public records responses to the organizational unitthat participated in providing documents, noting if a protective order precludes disclosure of any documents. On occasion a requestor may direct a request for identifiable documents to a specific employee, court, or judicial agency. In the event that an employee receives a public records request, the employee shall indicate to the requestor that they are not the designated person to receive public records requests. Employees should direct requestors to submit their request to the designated Public Records Officer, provide the contact information for thePublic Records Officer to the requester, and alert the Public Records Officer to expect a records request. The Public Records Officerwill work with the requestor to determine the appropriate format for providing responsive records. If records are requested with metadata intact, the Public Records Officer will work with the appropriate Information Technology Department (IT) to provide records in native format to the extent possible. If the request is for records that can best be provided through customized access to electronic records, the Public Records Officer shall work with the necessary staff that have responsive documents to determine the appropriate means of response. All courts and judicial agenciesmust make every effort to comply with the letter and spirit of GR 31.1 and respond by the due date as provided by the Public Records Officer. The Public Records Officershall coordinate the overall public records process, work with requestors to clarify requests, forward requests to judicial officers, judicial staff, or court employees, provide timely responses to requestors, and track all requests, exemptions, and responses. Court or judicial branchstaff shall promptly forward administrative records requests received from the Public Records Officer to appropriate staff members, ensure that those staff members make a diligent search for responsive records in a timely manner, ensure that requested records are not destroyed pending any request for them, and timely provide division responses to the Public Records Officer.